In an ideal world we would not need a book like this. Husbands would frequently fulfill one of their basic marital duties by sitting down and listening to their wives. Wives would be able to express their needs, wishes, and desires with clarity, and husbands would be committed to working on solutions. Likewise, wives would be eager to sit down and listen to their husbands to provide a similar function for them. But we do not live in an ideal world and apparently there are countless husbands who have no idea how to function in their marriages. We apparently need books like Holly Phillips' and those of Gary Oliver and Jim Dobson to guide these men. Holly Phillips has written her book from the heart of the Promise Keepers movement (literally and figuratively). Holly is the wife of founding president Randy Phillips, has been a PK staff member from its early days, and was the first woman to address a PK rally. Her book gives us a fascinating glimpse into the homes of PK staffers, especially the Phillips' themselves. No one can argue that Promise Keepers tries to sanitize its leaders, to present them as paragons of never­failing virtue, or to hide their personal, spiritual and psychological blemishes. In the tradition of the McCartney family, PK leaders such as the Phillips discuss their lives and struggles with remarkable candor and commendable honesty. The book is addressed to husbands whose wives have given them (or are about to give them) an ultimatum to change. The target audience for Phillips' book are men who cannot understand why their wives have never responded to them (or have stopped responding) and now need outside assistance. Holly seeks to help these befuddled husbands by telling the story of her own troubled marriage and how God has transformed it into a fulfilling relationship. The book's primary value is showing how God can rebuild a marriage that from any other perspective was doomed to fail. Randy and Holly brought into their marriage a host of unresolved problems that soon created marital distress. At one point Randy lost a ministerial position because the church board did not think his marriage was exemplary. The Phillips have obviously matured spiritually and psychologically as they have rebuilt their marriage from the ground up. Readers will rejoice with them as their story is told. "If there was hope for Holly and Randy Phillips, there is hope for anyone" (163). Of course, Randy could write the other half of the story, but his five-page response at the end of the book is a helpful, balancing statement, even if brief. The target reader is also a husband who has finally decided to be responsible in his marriage, perhaps as a result of attending a PK rally, but who doesn't know what to do next. As a result, the book is contextualized to a PK-type reader. Sports metaphors abound. We read about passing the baton, going the distance, and blindside hits. Of course, the New Testament also contains sports metaphors, so we can't complain. And maybe the targeted men really are sports-obsessed couch potatoes. But hopefully (at least some) men have interests broader than the NFL. Holly uses those initials in her chapter on communication to remind men what they need to talk about with their wives: needs, feelings and love. She ends the chapter with the slogan, "Become an MVP in the NFC' (119). Men are constantly referred to as "guys" in keeping with the style of the PK movement. At first this "aw, shucks" style didn't bother me, but by the end of the book I was more than a little annoyed. Casual English wears thin quickly. The book implies by its use of many illustrations that Christian marriages in this country are in a sad state. We know many of them are breaking up and landing in divorce court. But Holly is writing about intact Christian marriages. These couples don't communicate or relate well to each other, and are bored and frustrated with the state of their marriages. These same people are presumably attending church on a regular basis, listening to sermons about marriage and the home, and yet exist in a sorry marital state. Could this be an accurate picture? Is this what decades of traditional views regarding married men and women have produced, a generation of "leaders" and "submitters" who have failed to build quality into their marriages? If so, we need to go back to the drawing boards and re-design how we teach people what it means to be a husband and a wife. And if these marriages are typical, it should be an embarrassment to traditionalists who have held the upper hand in American evangelicalism for this entire century. One consequence of her many illustrations is that men seem to emerge as a gender of sloths and dullards who have trouble learning very much that is new, and who don't even realize problems exist until they are hit on the head with the proverbial sledge hammer. Holly Phillips is not a male-basher, but she accurately describes a significant number of men who attend PK rallies and write PK headquarters for advice. It is not a pretty picture regarding the current status of the American Christian male. The author is fair with the evidence when she speaks about genetics versus learning as the basic cause of gender differences in verbal ability and male self-centeredness. She makes a plea for husbands to do their share of"home work" (house maintenance) and parenting. She asks her readers, "Does the title 'husband' or 'father' seem as important a part of your identity as your title or job description at work?" (101). "This is an age when men feel constantly challenged by women who refuse to be passive doormats any longer" (15). "I do not see men as the heavies in our marriages. I do see—in both camps-neglect, a serious lack of consideration, and outright dishonesty and immoral conduct that is deteriorating the fabric of many of our relationships. However, I will not arrogantly argue that men are the single cause. We women need to be honest and share the responsibility. We need to solve our problems together" (15). "Many women . . . are frustrated about not being listened to or heard, not feeling valued, not being included or even considered" (38). "If we're going to improve relationships between the genders, we're going to have to listen and thoughtfully respond to each other" (53). The book is surprisingly free of gender stereotypes. 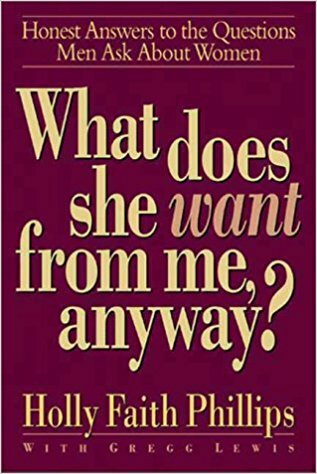 While some exist (Coach McCartney's Foreword speaks about male's positive responses to basic guidelines; Holly says most men are instinctively fixers, that most women want security of the heart rather than material security, and that "rugged strength [is what] I want and need in my leading man"), yet the reader is surprised not to find more stereotyping. Resorting to the "way men are" or "the way women are" usually occurs when an argument gets thin and weak. We are glad this book stays relatively free of that snag. It is also commendable that Holly has included a powerful and eloquent chapter on fairness in the workplace: "Basic fairness. Equal treatment and consideration. That is all most women want and need in the workplace. Would you, as a man, settle for anything less?" (213). She quotes Galatians 3:28 and applies it to the workplace. But regarding relationships in the home, the story changes. Since the founding of the PK movement, egalitarians have been keenly interested in how this gender-specific ministry views women in the home. What are rally attenders being taught to do? How does the Promise Keeper view his wife? Is the organization covertly or overtly traditional in its approach? The organization has sought to remain above the fray by not taking an official position on egalitarian vs. traditional approaches to the roles of men and women in home, church, and society. But Phillips' book does take some positions on these matters. While we do not know the extent to which Holly Phillips' approach reflects the wider PK movement, we can at least identify and clarify her own position. Holly views her husband as her leader and mentor (9). She urges men to be spiritual leaders in the home (198-99). Her call for male leadership is somewhat attenuated by comments such as, "Real leadership is knowing how and when to take charge and use your strengths. But it's also being mature enough to know and admit your weaknesses. And being confident enough in your masculinity to follow her lead where she is strong" (199). Another softening of the traditional approach to male-female roles in the home comes when she enumerates a list male and female needs, and then concludes: "See any similarities in what you need and what she needs? You should. Because in truth, her needs are your needs and your needs are her needs" (206). Nonetheless, she lists as a female need "a husband willing to assume spiritual leadership of the family . . . a valiant defender, a knight in shining armor, not a fief lord . . . a real man who will take the most difficult role there is—leader—and do it justice." She acknowledges criticisms of the PK movement, both critics who want an even stronger emphasis on male leadership and those who charge Promise Keepers with "promoting an outdated brand of repressive chauvinism" (86). The answer to these critics, she writes, is that the movement teaches servant leadership based on Ephesians 5. She seems unaware that Ephesians 5 speaks about servant headship, not servant leadership. "Leadership" is clearly an interpretive choice of meaning for "headship." She does not seem aware of this fact nor of the existence of a partnership model of marriage based clearly on biblical texts. She implies that positions that call for more equality are just "politically correct" (216) when many of us who are egalitarians call for equality in marriage because it is biblically correct. This book is an important one to read in our attempt to understand Promise Keepers.